Clinical instability of the cervical spine is defined as the inability of the spine under physiological loads to maintain its normal pattern of displacement so that there is no neurological damage or irritation, no development of deformity, and no incapacitating pain. While no tools exists for the assessment of upper cervical ligamentous instability, an approach that takes into account risk factors, patient history, and examination results to make judicious decisions about patient management has been recommended. 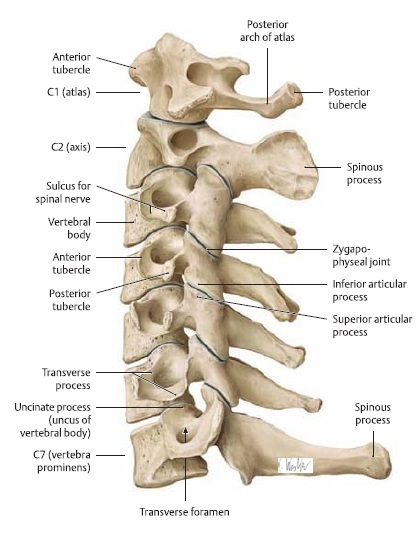 The cervical spine consist of 7 separate vertebrae. The first two vertebrae (referred as upper cervical spine) are highly specialised and differ from the other 5 cervical vertebrae (lower cervical) regarding anatomical structure and function. The craniocervical junction (atlanto-occipital joint), the lower atlanto-axial joint and other cervical segments are reinforced by internal as well as external ligaments. They secure the spinal stability of the cervical spine as a whole, together with surrounding postural muscles and allow cervical motion. They also provide proprioceptive information throughout the spinal nerve system to the brain. Neutral zone: motion occurring in this zone is produced against a minimal passive resistance. Elastic zone: motion occurring in occurring near the end-range of spinal motion is produced against increased passive resistance. Consists of vertebral bodies, facet joints and capsules, spinal ligaments (lig. longitudinale anterius and posterius, ligamentum interspinosum, lig. Interspinosus and lig. Flavum). Passive tension from spinal muscles and tendons. Provides significant stabilization of the elastic zone and limits the size of the neutral zone. Consists of spinal muscles and tendons, such as: multifidus cervicis, Longus capitis and the Longus Colli. Generates forces required to stabilize the spine in response to changing loads. Controls the motion occurring within the neutral zone and contributes to maintain the size the size of the neutral zone. Acts also as a transducer by providing the neural control subsystem with information about the forces generated by each muscle. Consists of peripheral nerves and the central nervous system. Receives information from the transducers of the passive and active subsystems about vertebral position, vertebral motion, and forces generated by spinal muscles. The subsystem determines the requirements for spinal stability and acts on the spinal muscles to produce the required forces. Clinical instability of the spine occurs when the neutral zone increases relative to the total ROM, the stabilizing subsystems are unable to compensate for this increase, which causes a poor and uncontrolled quality of motion in the neutral zone. Degeneration and mechanical injury of the spinal stabilisation components are the primary causes of increases in neutral zone size. It is generally accepted that cervical instability is caused by trauma (one major trauma or repetitive microtrauma). Cervical instability can also be a cause of delayed or missed diagnosis of cervical spine injury occurred after trauma (car accident, high impact on the neck) . The traumatic flexion-extension moment exerted on the spine can cause ligamentous disruption with subsequent atlantoaxial instability (AAI) also known as upper cervical instability. Although this occurs in very rare case its incidence is between 4.9 to 20%. It’s important to remember that problems in de neck region can be masked by problems in other regions of the body. A frozen shoulder (adhesive capsulitis) for example can be seen in conjunction with a cervical radiculopathy. Other shoulder pathologies such as brachial plexitis can also cause pain and weakness of muscles in the shoulder-neck-region. [LOE 5]. Certain Patients that might present acute neurologic symptoms that raise alarm for cervical compression or neck pain but without a specific origin should undergo a thorough physical examination and radiographic evaluation to determine the source. Cervical instability is a diagnosis based primarily on a patient’s history and reported symptoms. Objective criteria have been established in the analysis of end-range flexion and extension radiographs to diagnose cervical spine instability. However, radiographs do not provide information about the quantity or quality of motion in the neutral zone (ie, mid-range), which limits their value in the diagnosis of cervical spine clinical instability. MRI images could be useful to screen the integrity of the vertebral ligaments. Taking images during an anterior shear test or a distraction test shows a greater intervertebral distance and an increase in direct length of the ligaments. However, functional computerized tomography (fCT) and magnetic resonance imaging (fMRI) scans and digital motion x-ray (DMX) are able to adequately depict cervical instability pathology . Studies using fCT for diagnosing soft tissue ligament or post-whiplash injuries have demonstrated the ability of this technique to show excess atlanto-occipital or atlanto-axial movement during axial rotation . This is especially pertinent when patients have signs and symptoms of cervical instability, yet have normal MRIs in a neutral position. Cook et al tired to obtain consensus of symptoms and physical examination findings associated with clinical cervical spine instability. The study resulted in a list of 16 symptoms and 12 physical examination findings that is associated with CCSI. 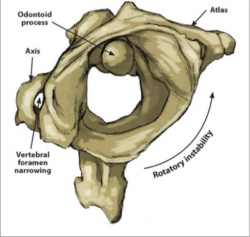 Because a definitive diagnostic tool has not been developed, cervical clinical instability will continue to be diagnosed through clinical findings, including history, subjective complaints, visual analysis of active motion quality, and manual examination methods. Cook et al proposed different identifiers for cervical spine instability. They divided them into different categories: movements, descriptive components, and postures. Patients also experienced neurological problems and headaches. One high quality systematic review by Hutting et al revealed poor diagnostic accuracy for all upper cervical ligament instability tests evaluated. In general, these tests have sufficient specificity and can rule in upper cervical ligamentous instability, but degrees of sensitivity varied. In the past few decades nonoperative maneuvers like traction, cast immobilization and long periods of bed rest had been replaced by the use of instrumentation to stabilize the spine after a trauma. This method can reduce the risk of negative sequelae of long term bed rest. The cervical stability can be received by using posterior fixation such as lateral mass plating, processus spinosus or facet wiring and cervical pedicle screws. The choice of which fixation is best, can be made by the surgeon after seeing a CT-scan or MRI. In a retrospective study of Fehlings, the cervical spine stabilisation was successful in 93% off the cases. Obviously this fixation procedure also holds some risks. It is possible that the spinal cord, vertebral artery, spinal nerve and facet joints get injured. Conservative treatment is indicated when cervical clinical instability does not severely involve or threaten neurological structures. The goal of nonsurgical treatment should be to enhance the function of the spinal stabilising subsystems and to decrease the stresses on the involved spinal segments. Enhances the function of the active subsystem. The cervical multifidus may provide stability via segmental attachments to cervical vertebrae. The longus colli and capitus provide anterior stability. One of the main goals of the non-surgical treatment is to improve the quality of controlled motion. Therefore proprioception exercises must be used, this will improve the control of movement in the neutral zone. The patient is not required to wear a brace. After 6 weeks it is not encouraged to do any lifting more than 4kg as also overhead work. The rehabilitation begins at week 6, mostly a basic stability exercises program. No cervical strengthening or ranges of motion exercises are encouraged in the first 6 months. The exercises or mainly focused on the neutral postural alignment, were the patients are recommended to us there trunk, hips and chest to produce proper cervical alignment. Partial suboccipital nod with a head lift in supine to strengthen the longus capitus and longus colli muscles - The patient lies on his back with his head on the table/a pillow. He nods and hold this position as he lift his head off the table/pillow. This position is hold during 2-3 seconds and then the patient lowers his head back on the table/pillow. 3-4 sets of 10 repetitions were performed. Active suboccipital nodding - The patient lies on his back with a pillow under his head and nods. The physiotherapist applies a little resistance to prevent the patient to perform a neck flexion. The patient is then asked to bend his neck from a neutral position to the point of first resistance and then return to a neutral position. The patient is instructed to keep her head on the pillow throughout performance of the exercise. 3-4 sets of 10 repetitions were performed. Craniovertebral sidebending isometric manipulation - With the patient in supine, head resting on a low pillow, passively position the cran- iovertebral region into right sidebending to the point of resistance to the motion. Manually resist further right sidebending by applying manual pressure above the right ear as the patient holds isometrically for 10 seconds. Passively reposition the patient into further right sidebending if the passive motion has improved, and then reapply the isometric force for 10 seconds. This sequence is repeated 3-4 times in 1 session. Quadruped position arm lift with spinal stabilisation. All those exercises can be performed at home in 3-4 sets of 10 repetitions. Craniocervical flexion- Start with pressure biofeedback inflated to 20 mmHg. Make sure your chin and forehead are lined up. Nod your head, keeping the large neck muscles soft and bringing the reading up to 22 mmHg. Work up to ten 10-second holds. Then progress to 24, 26, and 28 mmHg. Resisted shoulder extension with elbow flexed - “Set” your cervical spine, abdominals and scapulae, then extend your arm with elbows bent backward. Resisted shoulder extension with elbow straight - “Set” your cervical spine, abdominals, and scapulae, then extend your arm backward. Resisted shoulder shrug -“Set” your cervical spine, abdominals, and scapulae, then slightly abduct arms and minimally shrug shoulders. Straighten level 2 your elbows. Headlift - Start with your head in neutral (chin and forehead lined up), do a chin nod and lift your head, while maintaining your chin tucked. Hold for a count of 5 to 10 seconds and return smoothly with your chin still tucked. Shoulder stretches - “Set” your cervical spine, abdominals, and scapulae hold for 20 seconds. Shoulder stretches - “Set” your cervical spine, abdominals, and scapulae, hold for 20 seconds. Wall sit - “Set” cervical spine, transverse abdominus, and scapulae, then slide down the wall into a semi-squat position. Hold for as long as you can, working up to 2 minutes. Resisted neck side flexion - “Set” cervical spine, abdominals, and scapulae, then tilt head to the side. Resisted neck rotation - “Set” cervical spine, transverse abdominus, and scapulae, then rotate head. In the table below you can find the dosage recommendations for the evidence-based home neck care exercise program. ↑ Blanpied PR, Gross AR, Elliott JM, Devaney LL, Clewley D, Walton DM, Sparks C, Robertson EK, Altman RD, Beattie P, Boeglin E. Neck Pain: Revision 2017: Clinical Practice Guidelines Linked to the International Classification of Functioning, Disability and Health From the Orthopaedic Section of the American Physical Therapy Association. Journal of Orthopaedic & Sports Physical Therapy. 2017 Jul;47(7):A1-83. ↑ Choudhary AK, Ishak R, Zacharia TT, Dias MS. Imaging of spinal injury in abusive head trauma: a retrospective study. Pediatr Radiol. 2014 Sep. 44 (9):1130-40. ↑ McCracken B, Klineberg E, Pickard B, Wisner DH. Flexion and extension radiographic evaluation for the clearance of potential cervical spine injures in trauma patients. European Spine Journal. 2013 Jul 1;22(7):1467-73. ↑ Hutting N, Scholten-Peeters GG, Vijverman V, Keesenberg MD, Verhagen AP. Diagnostic accuracy of upper cervical spine instability tests: a systematic review.Phys Ther. 2013 Dec;93(12):1686-95. doi: 10.2522/ptj.20130186. Epub 2013 Jul 25.